Taste test: The problem with most lightly salted potato chips is that they don't have enough potato flavor. The problem with most unsalted potato chips is that they have hardly any flavor at all. These "no salt" chips are no exception. There's just no flavor. 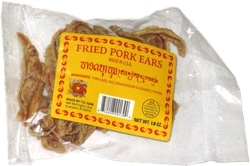 I would strongly recommend against eating them as a stand-alone snack. If you're going to dip them in something to provide flavor, such as ketchup as I did, they're not so bad. Another option would be to sprinkle some salt on them before eating. 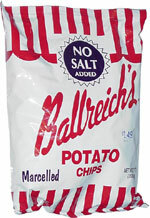 The texture is similar to the other Ballreich's chips, which have a much different crunch to them than most potato chips, and feel very moist on your tongue, thanks to the soybean oil that they're cooked in.